Aerospace and defense contractor BAE Systems is developing a film to block laser light from pilots and cockpits. They noted that the film has been measured as having 70% visible light transmission in a multi-wavelength blocking configuration. The BAE film may be similar in general concept to another film from Metamaterial Technologies Inc. which has been tested by Airbus and is entering the production and deployment stages. More information about anti-laser windscreen film in general and the MTI version specifically is here. A press release from BAE is printed below. BAE also made available a graphic with similar information; click the blue “Click to read more…” link to see these. UPDATED September 13 2017 —We reached out to BAE for additional details about their film; answers are after the press release and graphic. Airbus has entered into an agreement with Halifax-based Metamaterial Technologies Inc. to “validate, certify, and commercialize” MTI’s laser glare reducing filter for use on aircraft windscreens. This means that pilots will automatically be protected from the visual interference of bright laser beams — at least, lasers that have the same wavelength (color) that the filter protects against. The film is not designed to fully block the laser light. It will significantly reduce the glare and temporary flash blindness effects that can occur when a laser is aimed at an aircraft cockpit. This in turn reduces the potential hazard of a laser illumination. For more detailed information on Airbus’ and MTI’s plans, see this page which includes interview Q&A questions with George Palikaras a few days after the February 21 press conference. UPDATED April 14 2017: Metamaterials Technologies Inc. closed an $8.3 million round of funding. This will be used to support commercialization of the windscreen film and to add needed staff. MTI can produce metaAIR sheets 80 cm wide by 100 cm long, which is sufficient for standard cockpit windows that are 60 cm wide. However, the process is currently semi-automated and needs to be fully automated. MTI is also looking for new headquarters. From the Chronicle Herald. 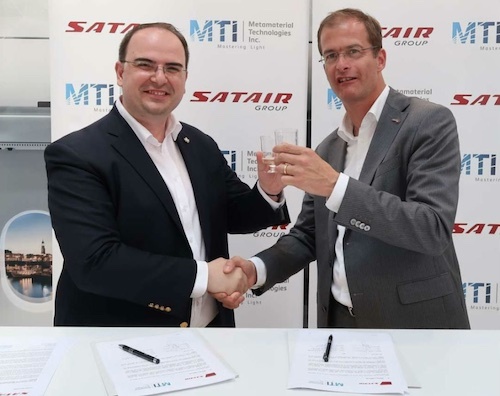 UPDATED July 5 2017: MTI will be making its metaAIR anti-laser windscreen film available to non-Airbus aircraft, through aviation parts supplier Satair. An interview with George Palikaras goes into details. Metamaterial Technologies Inc. issued a press release dated February 21 2017, which is reprinted below. 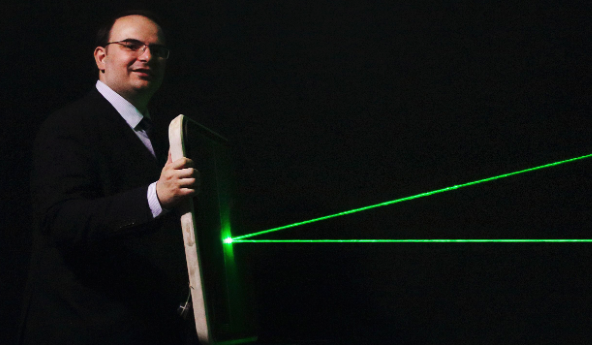 Airbus will be testing a film said to reflect laser light, from Halifax-area manufacturer Lamda Guard. The announcement came at a June 4 2014 press conference jointly held by the two companies. 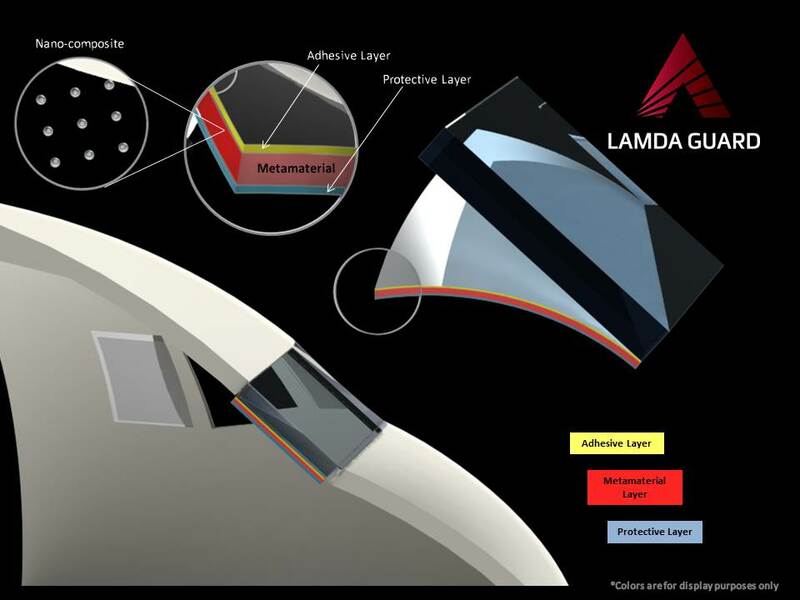 Lamda Guard’s “metaAir” film uses metamaterials, also called nano-composites, to reflect one or more laser colors without interfering with normal visibility. According to the company, the film can protect from beam angles up to +/- 50 degrees away from head-on. This has benefits when protecting cockpits against laser strikes, which can come from any angle. It can be adhesively applied to glass or clear plastic; applications include eyewear, protective goggles and windscreens. 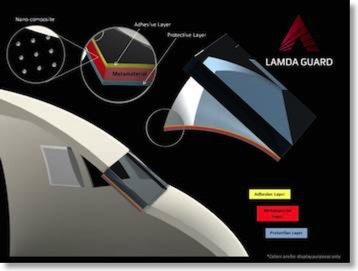 Lamda Guard says that the Airbus tests on windscreens will mark the first time an optical metamaterial nano-composite has been applied on a large-scale surface. General schematic of metaAir film. Click for larger image. The metaAir film can be engineered either to absorb or reflect the desired wavelength(s). For aircraft application, the reflection approach is being used in order to block undesired light wavelengths from entering the cockpit. The reflection bandwidth is currently in the 15-20 nanometer range. For the most common type of green laser pointer -- responsible for 93% of FAA reported incidents in 2013 -- with a wavelength of 532 nm, the film would block light from about 522 to 542 nm. 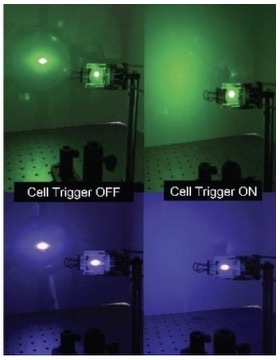 Additional wavelength blocking can be added as well, such as the 445 nm blue used in powerful handheld lasers such as the Wicked Lasers S3 Arctic that has up to 2 watts (2000 milliwatts) output. Two key advantages of blocking laser light at the windscreen are that pilots do not have to carry or use laser protective eyewear, and there is absolutely no interference with the visibility of aircraft instruments. In preliminary tests, the anti-laser film had a narrow enough bandwidth that it did not interfere with airport lights seen outside a cockpit. Because of ultraviolet degradation to the adhesive layer that adheres the optical metamaterial to the windscreen, the film would need to be replaced after about 5,000 flight hours. This translates into overnight replacement roughly once every three years. The optical metamaterial itself would not have a flight hour restriction. In addition to piloted commercial aircraft windscreens, Airbus will also be investigating related applications such as piloted military windscreens, UAV camera protection, and sensor protection for satellites and airborne platforms.